French-born Italian engraver and publisher (originally Antoine Lafrry). Lafreri is best known for devising Lafreri atlases - atlases in which sheet maps by various cartographers are bound into a single (unique) volume according to each customer s requirements. Born in Orgelet in France, Lafreri settled in Rome as an engraver in 1544, but by 1553 had moved into publishing. 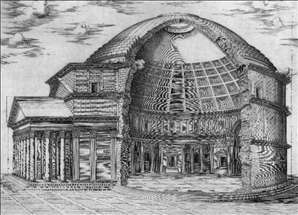 A particularly sumptuous production was his Speculum Romanae magnificentiae/The Mirror of Roman Magnificence (1575), but he was also known for his output of prints by Marcantonio Raimondi. Lafreri s own imprint occurs on a number of atlases issued between 1556 and 1572, the later ones under the title of Tavole moderne di geografia. 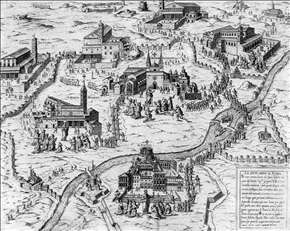 From the 1540s to around 1600 there existed in the centres of Rome and Venice a group of cartographers, engravers and publishers who were responsible for a highly productive period in Italian mapmaking. It was not the intention of the various practitioners to create coherent atlases in the way that we now understand them but rather to produce loose sheet maps of those regions which were their particular interest. Antonio Lafreri went so far as to produce a title-page for one such map compilation. As a result, despite Lafreri being a relatively minor publisher, these bound collections of maps became known as Lafreri Atlases and the disparate group of mapmakers themselves fell under the term the Lafreri School . 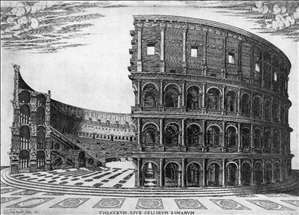 See more details about "The Colosseum in Rome"
See more details about "The Pantheon in Rome"
See more details about "Pilgrims visiting the Seven Churches of Rome during the Holy Year of 1575"